Cambodian cuisine may not be renowned worldwide, but its in-country following is well-established and unwavering. With accents from Vietnamese and Chinese food, Khmer dishes appeal to a diverse array of palettes and cooks. Since many meals are quick and easy to prepare, the Cambodian menu offers even the most novice chefs a chance to shine. 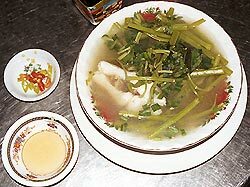 Sour soup is among the most popular Khmer foods. For years, this vegetable stew has fed hardworking Cambodians, particularly in the countryside where ingredients are easily found in neighboring pastures and ponds. Today, city dwellers enjoy this dish as a healthy alternative to fried bananas and fish. 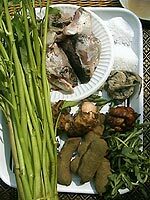 Expatriates living in Cambodia also are realizing the healthy benefits of eating a diet of fresh fish and water green, the base of Khmer sour soup. Since most cooks journey to the market in the morning to pick up fresh ingredients, like water green, Khmer sour soup is often enjoyed for lunch and not dinner. Before heading home today, head to the market for a few key ingredients, so that you too may share a taste of Cambodia with your family. Clean vegetables and fish. Bring one liter of water to a boil. Add Romdehng to water. Using a spoon, pound Prahok into a soft paste and remove small bones. Add paste to boiling water. Add a small pinch of salt. Pound tamarind and pour into water, which now should be simmering and not boiling. Combine fish with other ingredients and cook for about 10 minutes. Increase temperature to high, adding water green to water as it comes to a boil. Reduce temperature to a low setting to prevent water green from losing its fresh taste. Cut Ma'am into slices and add to soup. Enjoy with white rice!